The government’s security clearance background-check backlog is set to drop from 600,000 currently to half that by next spring, Sue Gordon, principal deputy director of national intelligence, said on Tuesday. By the end of the year, she added, the Office of the Director of National Intelligence will be ready to promulgate policies and standards aimed at helping agencies and contractors harmonize their criteria for investigating and adjudicating applicants for security clearances, she said at an Arlington, Va., panel organized by the Intelligence and National Security Alliance and George Mason University’s National Security Institute. 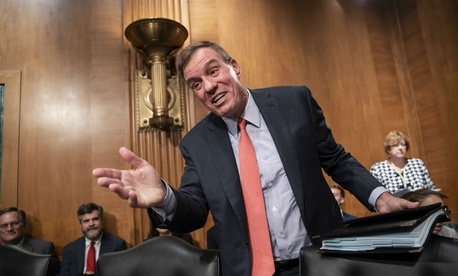 Pressed for faster action by Sen. Mark Warner, D-Va., vice chairman of the Select Committee on Intelligence, Gordon would promise only that the standards will be publishable in fiscal 2019. The discussion of how federal agencies and their contractors can accelerate the process of determining who can be trusted with the nation’s secrets came during the Senate’s home stretch for enacting bipartisan security clearance reforms as part of the 2018 Intelligence Authorization Act. It comes also as the White House readies an executive order that will complete the move of the National Background Investigations Bureau to the Pentagon from the Office of Personnel Management. The government’s efforts to bring in skilled talent while minimizing insider threats to classified information “has been paralyzed by a commitment to almost zero risk, when obviously we will never have it,” retired CIA official Charlie Allen said in introducing the panel. The intake form SF-86 “has not been modernized since the 1980s, and they’ve added another 30 questions,” he said. “We have met the enemy and it is us,” said moderator Letitia Long, former director of the National Geospatial-Intelligence Agency. But the “personal engagement” of Gordon “shows that the intelligence community takes its responsibilities seriously,” she said. In conducting oversight of agencies for which security clearance background checks are not the highest priority in budget priorities, Warner said “the best news” is that ODNI Dan Coats “acknowledges that the backlog has moved from a problem to a crisis” that requires more than incremental change. Coats himself, after serving on the Senate Intelligence panel before Trump named him to head the IC in January 2017, had to go through a two-month wait for full clearance. In pursuing uniform standards across government, the Office of Management and Budget has been too slow, Warner said, while the Homeland Security Department has failed to even acknowledge the extent of the problem. He called for quarterly progress reports and making sure agencies prioritize the security clearance process. And while universities and local police can’t be mandated to share college transcripts and arrest records, “there are incentives” to be acted on, Warner said, citing the potential of withholding federal money. Gordon and Warner agreed that contractors should have “equivalent access” to security clearances. “All serve the American people,” she said. And both agreed that “continuous evaluation” of experienced employees with long-standing clearances could be accelerated through data analytics and data sharing—with proper respect for privacy legalities—in place of periodic reinvestigations. “But there’s a gap,” Gordon said, noting that the intel community currently has access to seven data streams from 20 agencies, with 15 more agencies soon to participate. “People doing the continuous evaluation must be able to use the data in real time, without having to go back” to redo an investigation. Speaking for contractors was Kevin Phillips, president and CEO of ManTech, who cited “a lot of movement” to address the backlog in the pending intel legislation, previous versions of the National Defense Authorization Act and the president’s management agenda. Phillips added that he’d like to see a contractor workforce of security-cleared people who can remain eligible after retirement, like the armed services reserves. When Congress returns after the midterm elections, Warner said, “We will get the intel bill across the line,” adding that even if the larger bill were to fail, there is sufficient bipartisan support for separately passing the title dealing with security clearance reform.